We arrived in Galway late in the afternoon and had a short visit to the cathedral before checking into our hotel. We were greeted by a beautiful sunset bursting with orange, pink, and purple hues. I drank on the magnitude of the scenery of the imposing cathedral with the orange and purple sky in the backdrop and took quick pictures inside. The following morning, I decided to go back to the cathedral to learn more about its history and to admire the artwork. With a camera hanging around my neck, I headed to the cathedral, passing narrow cobbled streets lined with pubs, restaurants and gift shops. The streets were empty and quiet except for the sound of small delivery trucks revving engines. As I was about to cross the bridge leading to the Galway Cathedral, I saw two rivers diverged. (To borrow a phrase or two from Robert Frost's 'The Road Less Taken'), I looked down as far as I could to where a wooden foot bridge lead to a grassy pathway dividing the river. I took the grassy pathway, it seemed less traveled by. I saw a couple walking, and a nice older lady who stopped me in my track and gestured out for me to look into the river bank where a bird was trying to spread its wings and pose for the camera. I saw lots of wildlife (birds) to the backdrop of great architecture. I’m not very good at taking notes of street names and directions, but I had a map of the city in my backpack. I just kept walking along the river heading north. And under the startling blueness of the Galway sky, something arrived like a landscape worth a thousand words. I thought I unearthed some of Galway’s best-kept secrets for photographers. And the walk to the grassy trail made a difference. Another ten minutes of walking across the Salmon Weir Bridge brought me to the dominating Galway Cathedral, which is officially called, the Cathedral of our Lady Assumed into Heaven. Although it’s fairly new (built in 1965), it serves as a museum with amazing artwork from the marble floors to the curved ceiling to the stained-glass windows behind the altar and the rose windows across. The building is a mixture of Renaissance, Gothic and Romanesque design and built entirely on Galway limestone and natural materials sourced from the natural richness of the surrounding area of Galway. I followed the big river back to my hotel through its pathway and walls with the sound of rushing waters that drowned the noise of delivery trucks delivering goods in the early morning. At the end of the river, I found the same familiar view. To my pleasant surprise, it was the view I woke up to that morning. I realized that our hotel was at the foot of the Claddagh Quay. 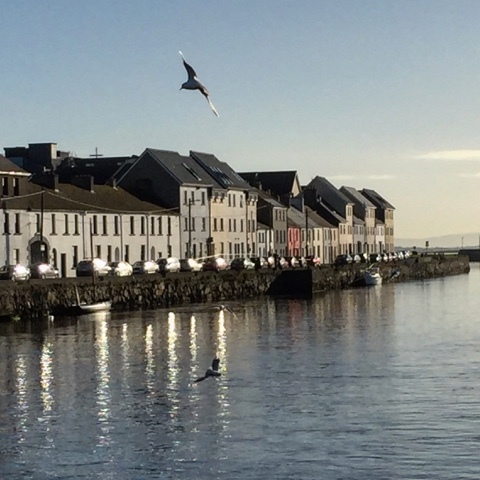 I crossed yet another bridge to see another beautiful landscape, the quay with seabirds flying around, the quaint commercial buildings and old churches reflected in the waters that flow into the Galway Bay. It has been said that Galway is one of the fastest growing city in Ireland, and I can see why. When traveling through a quaint and beautiful city as Galway, it tends to make me feel as if I belong to the place.